For these two, I made ‘ stencils’ out of construction paper for her – one of a bat, and one a Jack o’ lantern. 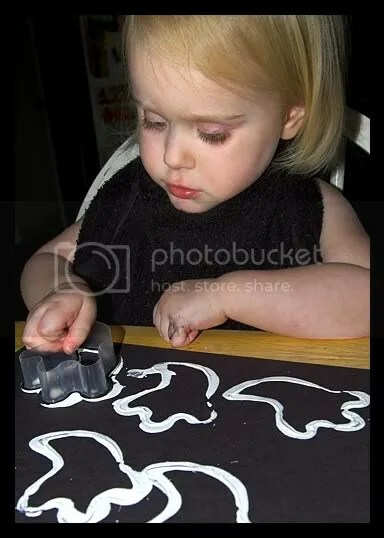 After explaining the concept of stencils, I gave her several sheets of paper, and she went to town. Super simple – and the kid really liked this one! We had to hand-make black paint, since it didn’t come with our uber-colorful paint set, but I’d say dark grayish-brown gets the point across! It actually dried pretty blackish, and the black glitter we added later helped with that, too! 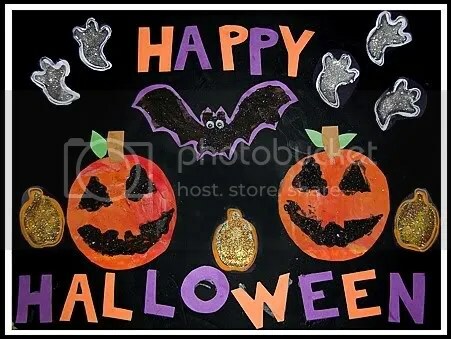 (black, orange, and white Halloween glitter for $1 at Joanne’s!) Notice the giant black towel serving as a smock in these pics. I wasn’t going to mess around with the washabillity of black paint. We also snagged some Halloween cookie cutters from the dollar store this weekend. 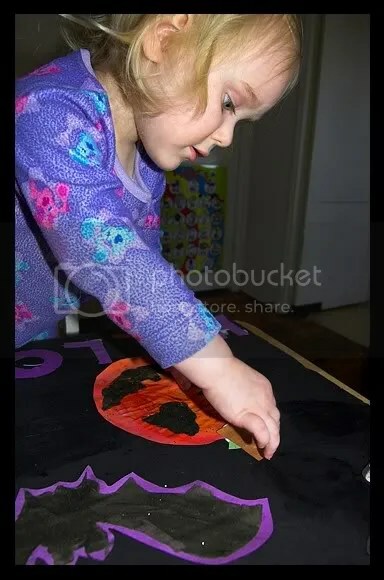 T used the ghosts and the pumpkins as stampers… another fun project that didn’t really involve me too much. I like that kind – and she, of course, had a grand old time. . . The next day sent us more cold and rainy gloom, and an increasingly cabin-feverish toddler. After wracking my brains, I decided that we could make a poster. 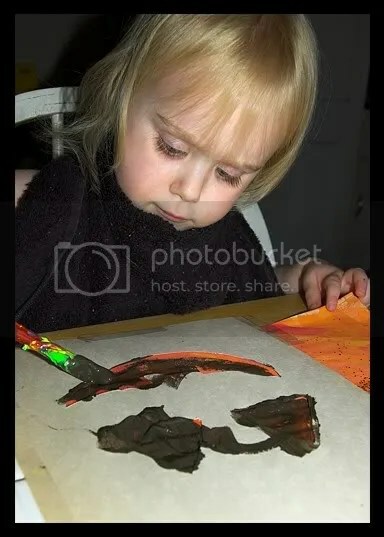 So I cut out all of the letters that spell Happy Halloween, and all of her pretty pictures from the day before, and she went to town. 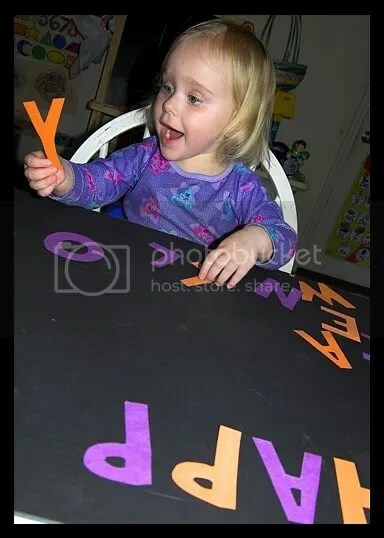 She had such a great time with the letters. I’d tell her which letter we needed next, and she’d dig through the pile until she found it – with extreme triumph and excitement. Then all of her past creations were glued on. . .
Several applications of Halloween-y glitter later, TA DA! Our new Halloween Poster is hanging on Puff’s Wall of Creation! Wow, that’s a really cOOl poster! I can’t wait to see it in person. 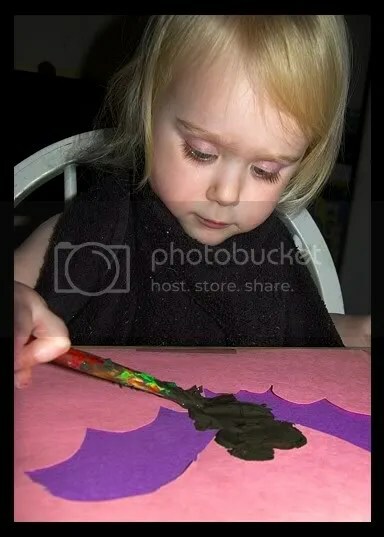 She’s way better at this kind of thing than I will ever be. ;] Start ’em young. 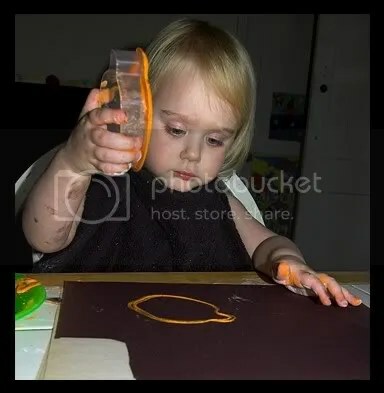 Ki – you crack me up with your hatred of arts-n-crafts. She’ll be THRILLED to show it off to you (and anyone who walks through that door)! Wecki – 😦 I wish you could be, too. You and your lady could come hang out, and we’d have so much fun together! Fan – thank you for always being my biggest! Glad you like it, she’s SOOO proud of herself! I love seeing what your girlies come up with, too!